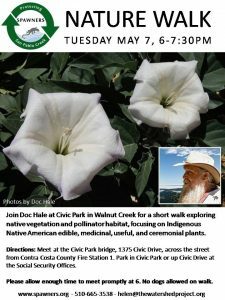 Join Doc Hale at Civic Park in Walnut Creek for a short walk exploring native vegetation and pollinator habitat, focusing on Indigenous Native American edible, medicinal, useful, and ceremonial plants. Please allow enough time to meet promptly at 6. No dogs allowed on walk. Directions: Meet at the Civic Park bridge, 1375 Civic Drive, across the street from Contra Costa County Fire Station 1. Park in Civic Park or up Civic Drive at the Social Security Offices.